The Daily Dimwit: One Heck of a day at the LCS... Another BOOK! The wife and I were driving around Mobile and Spanish Fort today, decided to stop by the LCS. I have been selling a lot of cards on their consignment eBay store and had a nice credit backlog so I went for a couple of hobby boxes. 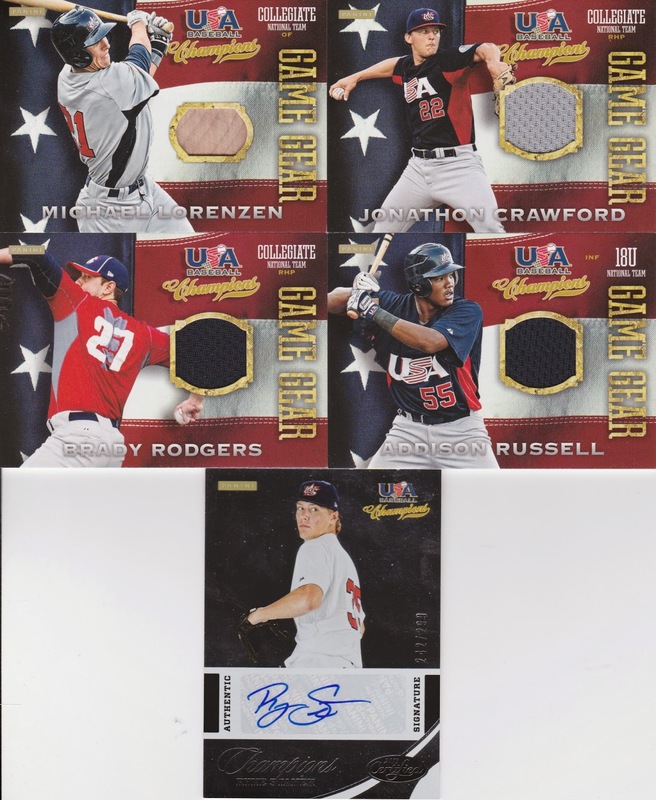 The bat relic is a tough pull, not too bad on Brady Rodgers (Astro) and Addion Russell, who I think will burst onto the scene with the A's soon. The lone auto is Ryan Stanek from the Rays, hopefully he pans out. All of these are for trade, as I already have a Rodgers. I am working to get a trade bait page going, since I have very little and am going to try and keep very little here at the house. WOW WOW WOW WOW... the wife was there to witness, my hands were shaking when I pulled this one out of the wrapper and was even more shocked as I unfolded it to see who was inside! I now own checklist card #1 and #2 of this subset; and looking at the checklist the two I have are probably the best to have pulled (except for #4, which has some real rookie star power). But I'll take proven HOF'ers over prospects any day! This is the second book I've pulled myself, and I do believe this one too shall stay in my collection! All are bat pieces, except the Mays which is a nice old school jersey. Wow, indeed! Congrats on the major score! Holy crap!!! I'm obsessed with TTT as well but so far have only picked up some singles. Hoping I can get a whole box at some point and maybe be as lucky as you. That booklet is awesome, great player selection and beautiful card. I always look at Triple Threads as a gamble and yours definitely paid off! Congrats, man! I've been trying to get my hands on some Triple Threads for a while, but my LCS never seems to have any in stock. Seeing this is making me even more anxious to get my hands on some. Wow, epic book! Awesome pull buddy! The Miller isn't shabby either. Did you happen to get either a Nomar or a Varitek base card out of your box of USA? Just curious.